1. When a child is born, that child will need a loving family around them to take care of them until they reach adulthood and have their own family. That will never change. The family may change but the ancestry of the child will not. Ancestors are the main characters in the Life story of every child. 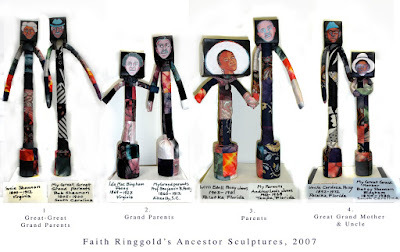 How are ancestors can tell us who we are. The more we know our ancestors the more we know ourselves. My mother, Willie Posey Jones was as loving as a mother could be. Once I was sick in bed with chickenpox and had to miss my weekly allergy shots for asthma. Mother was afraid I would have an attack and so was I. “I’ll call the doctor and ask him if I can take your shot for you? “, she said. I was amazed that the doctor agreed. Another time I was gasping for breath with a very bad asthma attack, when my mother told me, “ No one has ever died of asthma.” that statement may have very well saved my life. Daddy was hard-working, but a full of fun guy. He used to take me to the baseball game to see the Giants, his favorite team. The Giants lost every game I ever saw them play, but daddy rooted for them just the same. He would be the only one in the center of the opposing teams adoring fans. Daddy would cheer like a winner. He taught me to be faithful to my beliefs even if it’s unpopular and or an under dog. 4 Ancestors are for real! 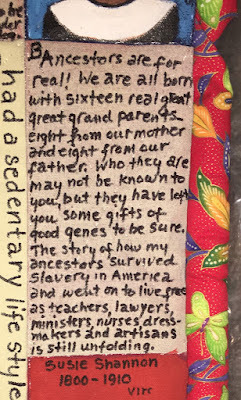 We are all born with sixteen real great-great grandparents eight from our mother and eight from our father. Who they are may not be known to you, but they have left you some gifts of good genes to be sure. The story of how my ancestors survive slavery in America and went on to live as teachers, lawyers, ministers, nurses, dressmakers, and artisans is still unfolding. My great, great, grand mother Susie Shannon is my ancestral heroin. Susie lived to be 110 years old, but she never would talk about her life as a slave. She’d say, “just leave it alone.” She didn’t want to remember, what she surely could never forget. Knowing this, I have written Susie’s stories for her. I want to pay tribute to her life and celebrate those brave men and women who survive slavery and in so doing help define freedom in America for all people. My Great-great grandfather, Bob Shannon didn’t live nearly as long as Susie. However, in those days most people live short lives that as they were racked with pain and burdened with hard work for no pay; a short life was more than likely merciful. I have no photographs of Bob Shannon but I’ve heard he liked all the people on my mother side were spiffy dressers. I could imagine him sporting a brimmed hat with the suit, like all the men in my family. 7 My great grand parents Betsy and Peter Bingham ham we’re a fabulous couple. The family tradition of education more than likely began with them. Uncle Cardoza often told me about living with them before he went into the army. 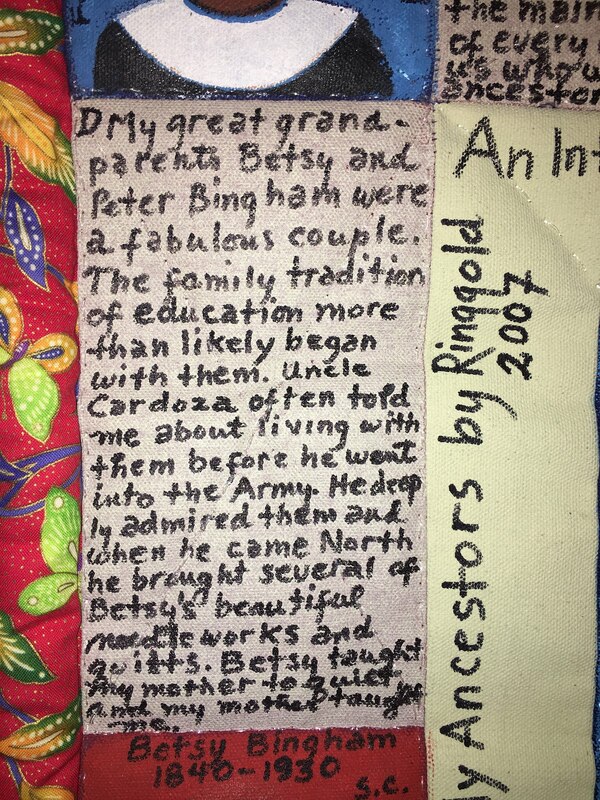 He deeply admired them and when he came north he brought several of Betsy’s beautiful needle works and quilts. 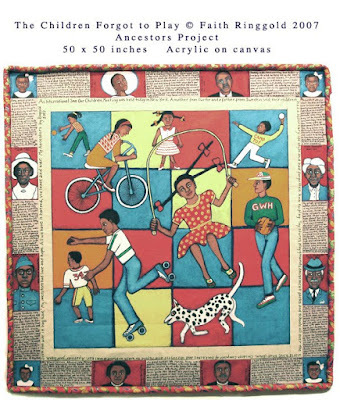 She he taught my mother to quilt and my mother taught me. 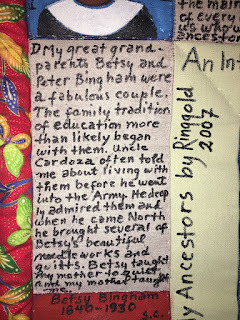 When my move to Englewood New Jersey provoked to my neighbors hostility toward me, I created a series of story quilts titled coming to Jones Road with a great grandma Betsy as my heroin. I renamed her aunt Tammy but she was really Betsy in one of her silk organza dresses with matching hat and drawstring bag. That’s he was just the kind of elegant and magical woman who can come to Jones Road and live free surrounded by hostile neighbors. Uncle Cardoza was my grandfather, B. B. Posey’s oldest son. He was left to further the family tradition of culture and education. Uncle Cardoza would tell me every time I graduated that my next graduation would, “ be the one.” “A Masters in terminal degree for artist,” I told him. In 1986 I got my first of 19 honorary doctorate to date. If they could see me now 19 big ones! 10 My grand parents, B B and Ida Posey were both teachers in the south. How ever when B.B. 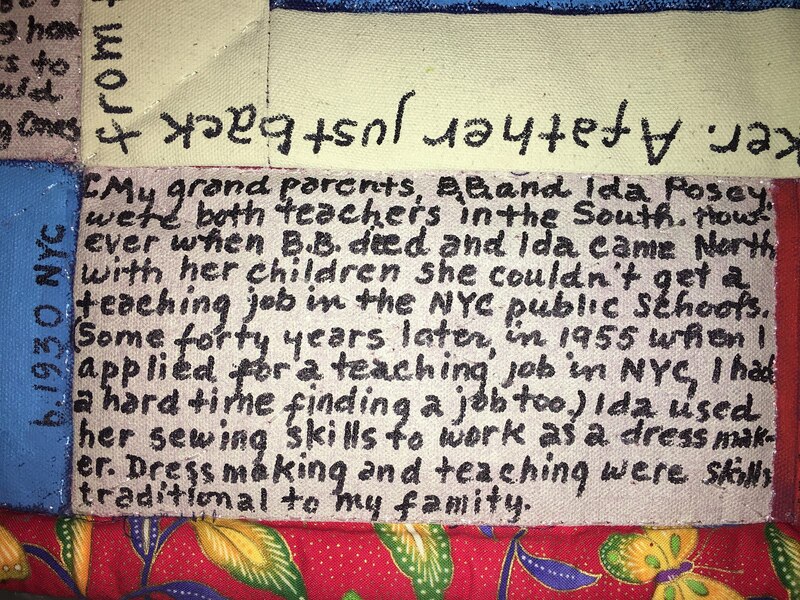 died and Ida came north with her children she couldn’t get a teaching job in the NYC public schools. (Some 40 years later in 1955 when I applied for teaching job in NYC, I had a hard time finding a job too.) Ida used her sewing skills to work as a dressmaker. 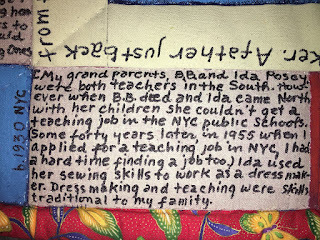 Dressmaking and teaching were skills traditional to my family. My grandmother, Ida Matilda Posey was a gentle, sensitive woman, who was loved and respected by all who knew her. When grandfather BB Posey died she was never quite the same. His passing left an empty space in her life. Coming to New York City probably did her no good. She missed her home, her family, friends, her church and every thing back in Florida. She was sad, but Iher dying words, “I am going from glory to glory,” were full of joy. I have a hand painted a photograph of my Grand father, Professor BB B Posey, over my desk in my office. He is my ancestral hero. I became a teacher because I share his love of education and teaching. He taught in Florida and South Carolina, taking his wife, Ida who also taught, before she had her first child. BB Posey die before he was able to send all of his children to college but he in stilled in them the importance of Learning and a determination to be educated.